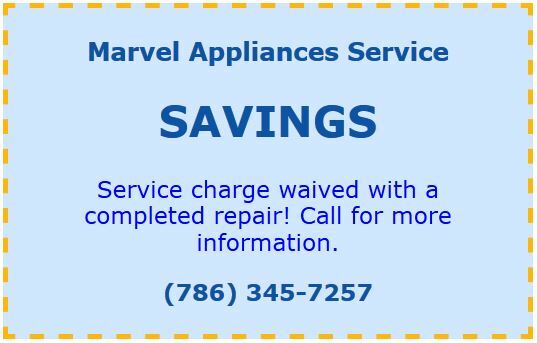 For appliance repair service that you can trust in Miami, turn to Marvel Appliances Service. We’ve been in business since 2008, and we’re committed to bringing area home- and business owners the top-notch appliance repairs they deserve. Contact us to discuss refrigerator repair, oven repair, washer/dryer repair, and more. Whatever issues you’re having with your appliance, we’re confident that our technicians have the knowledge, skill, and training to get it working like new again. Schedule your appliance repair appointment today! Marvel Appliances Service is based right here in Miami. We’re available to provide residential and commercial appliance repair in Key Biscayne, Miami Beach, Hollywood, Kendall, Miramar, Pembroke Pines, Tamiami, Coral Gables, and Hialeah, as well as the surrounding area. As a locally owned appliance repair business, we care deeply about providing the best possible appliance repair service to our community. We’re even members of the Key Biscayne Chamber of Commerce. You can count on Marvel Appliances Service to always have your best interests in mind. In addition to quality workmanship, we prioritize quick turnaround times and affordable prices for appliance repair services. Whether you need dishwasher repair, air conditioning repair, or furnace repair, we’ll show up at the scheduled appointment time, quickly diagnose the issue, and work efficiently until repairs are completed properly. You’ll get that speedy service coupled with some of the lowest prices for appliance repairs in the Miami area. For your added security, we back up our appliance repair services with a 90-day guarantee on all parts we install as well as our technicians’ work. We want to be your go-to appliance repair company, and that means earning your trust and confidence. Marvel Appliances Service is fully licensed, bonded, and insured. We’re also EPA certified to handle refrigerants. You can feel 100% safe putting your valuable appliances in our capable hands. Want to learn more about hiring us for dishwasher repair, washer/dryer repair, furnace repair, or another job? Give us a call today! Marvel Appliances Service is here to serve you.